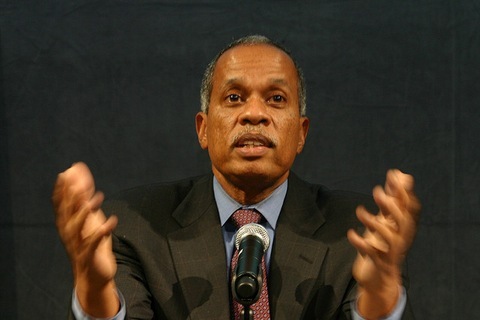 NPR’s firing of Juan Williams this week for remarks about Muslims on Fox News has spawned numerous side discussions among journalists, commentators and politicians about media ethics, views of Muslims in the U.S. and public media funding. We’ll have more on this topic on Friday night’s NewsHour broadcast. Such appearances led NPR’s ombudsman last year to declare him the biggest lightning rod at the radio network. Many people rushed to Williams’ defense, even crashing NPR’s contact us page, with questions as to why he was fired so quickly. NPR has been distancing itself from Williams for quite a while now, changing his title and reducing his role at NPR amid increasing discomfort over the views he has voiced as a pundit on Fox News Channel. Back in 2009, when Williams described first lady Michelle Obama of evoking the spirit of radical Black Panther Stokely Carmichael, NPR asked him not to use his identification with their organization on Fox News. They had already changed his title from correspondent — which implies an objective journalistic role — to news analyst, which allows opinionating. To this media critic, Williams’ firing seemed the ultimate expression of that unease; his comments about Muslims were simply the final straw on a very overburdened camel. The incident has prompted plenty of soul-searching among journalists about when speech crosses the line and the common threads between recently ousted media personalities. As it occasionally happens, the story has stirred up calls from some conservatives to cut funding for NPR, PBS, the Corporation for Public Broadcasting or all of the above. Republicans have long sought to defund NPR and it’s [sic] television sister, PBS, loathing government-run anything competing with the private sector. Though, even when the GOP controlled both chambers of Congress and the White House back in 2005, a move to defund them failed after 87 House Republicans broke ranks and voted to reinstate money that had been stripped in committee. It may be a fine point, but it’s an important distinction. The federal government can’t “defund” NPR. What Congress can do is cut CPB funding — which has diminished over the years and has, at times, been threatened. But those CPB funds play a minor role for a large-market station like WBUR (around 6 percent) and represents a much higher percentage for stations in smaller markets, such as Wyoming and Idaho. Calls to cut taxpayer funding of CPB would mostly hurt small stations — stations that played no part in the decision to fire Juan Williams. Tune in to Friday night’s NewsHour for more on this subject.